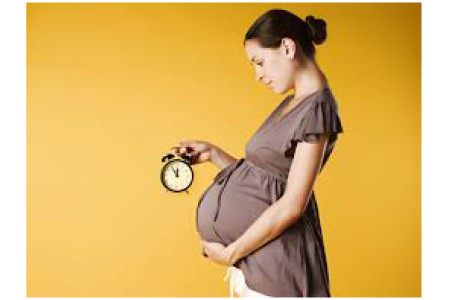 A recent article found that aging of the fetal membranes may be the signal for the start of labor. They found that telomere fragments were higher in women in labor and that those fragments were part of the inflammatory cascade initiating labor. 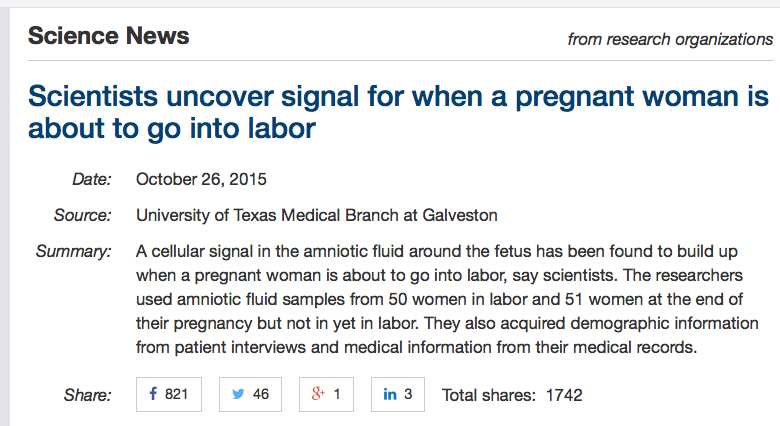 As an Obstetrician by training, this should have come as no surprise to me. We have always known that the passenger signals when he or she is ready to be born. 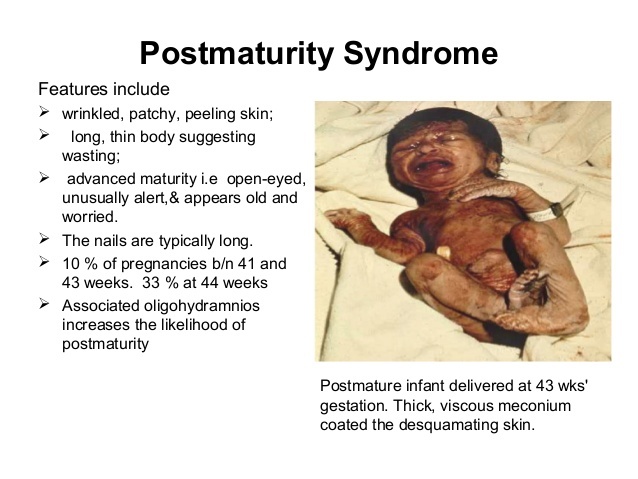 If the signal is not received properly, the syndrome of postmaturity occurs in which the babies start to loose weight and look old and wrinkled to say nothing of the calcified and withered placenta and membranes that we used to deliver on women well past their 42 weeks of pregnancy. This research suggests that the placenta must normally age and approach its death in order to signal the onset of labor. What I found interesting is that the authors attributed the telomere shortening solely to oxidative stress, ignoring the main mechanism of telomere shortening which is replicative senescence. I think the reason for this is a simple act of denial created by human-engendered cognitive dissonance. Because of the linear nature of our experience, we feel using a word like aging could have no relevance to a life before birth. In fact, we have long known that the fastest telomere attrition occurs during in utero life and in the years before puberty. At conception, the fertilized egg is reset like a pinball machine to around 15,000 base pairs and in the frenzied copying of making a human newborn, one third of that length is lost resulting in a birth endowment of 10,000 base pairs. I used to think that a telomerase activator in utero might add another 33% to life expectancy. In other words, an 80-year median life expectancy would become 120 with a maximum extended another 33% to 160 years. But what if aging of the cells is an integral part of fetal development? Would telomerase enhancement not only prevent labor (which would be trivial because we could always induce labor) but could it prove to be a potent teratogen (a word meaning a substance which causes ‘monsters’ or birth defects)? This would be a very valuable experiment to conduct. It is important to establish whether telomerase activation might alter normal fetal development or whether it just adds to the birth endowment/life expectancy without any attendant risks other than a risk of delayed labor onset. The patient that I had who conceived twice on telomerase activators and took them during a critical time of embryogenesis has two perfect sons that she conceived and bore in her 40s after many years of infertility. Still, when patients conceive on TA-65, I advise them to stop. In the case of Nina that we discuss in this seminar, I don’t honestly know whether her difficult pregnancy conditions led to a more hostile milieu for her sons but we Obstetricians are a conservative bunch. How wonderful it would be to have experiments proving that telomerase activation and lack of fetal “aging” does NOT inhibit normal growth and development but only confers longer healthy lifespan! The issue of whether puberty represents the death of the child is another interesting way to conceive of it. For most of us, young adulthood would be the best time to stop aging programs because from 25 to death, no good seems to come from those programs. But from a species and ecological level, perhaps the death of the individual allows the species to be reborn each generation. It would seem that the more I know, the less I understand. But that doesn’t mean these and other questions won’t someday be answered. It says that aging helps to stabilize ecosystems, which without it will tend to boom, bust and crash. So as we learn to cure aging, we’ll want to be conscious of keeping our ecosystems stable… An interesting challenge, especially to do this in a way that supports real evolution rather than justifying a status quo.